Carl Maes has resigned as head of women's tennis at the Lawn Tennis Association for personal reasons. The Belgian, who only held the position for a little over two years, said: "This was a difficult decision for me. "I am proud of the progress made in British women's tennis during my time at the LTA and firmly believe we are heading in the right direction." Player director Steven Martens and the head coach of women's tennis, Nigel Sears, will continue in their roles. 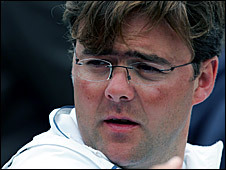 Maes, who coached fellow Belgian Kim Clijsters for three years from 1999 before being appointed head of the LTA's academy in 2002, took on the role of resurrecting the women's game in Britain at the end of 2006. The top British players were not troubling the top 100 in the world and Maes was charged with turning around their ailing fortunes. Why don't these people want to work for British tennis anymore? To some extent he succeeded when in 2008 Anne Keothavong became the first Brit to break into the top 100 since Sam Smith in 1999. And Laura Robson sensationally won junior Wimbledon last year at the age of 14 and reached the final of the Australian Open's equivalent in January. But British number one Keothavong, who was ranked a career-high 48th in the world in February of this year, is his only success in terms of achieving top 100 rankings. Former British number one Katie O'Brien climbed to 104th last year while Melanie South is currently 111th and Elena Baltacha has never gone higher than the 107th she reached earlier this year. Martens said: "I would like to thank Carl for his work in developing women's tennis in Britain over the last two and a half years. "He has played a large part in the improvements in this area and has built strong foundations for the sport. "There is still plenty of work to be done and I am confident that, under the guidance of Nigel Sears and the team, women's tennis will go from strength to strength."